ESW 09/2 — European Shark Week	» Deutsche Elasmobranchier-Gesellschaft e.V. 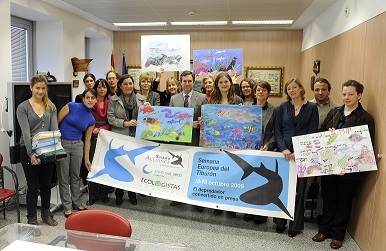 Madrid: Representatives from the Shark Alliance, an international shark conservation coalition, today delivered to Spanish authorities a petition signed by over 90,000 citizens from 16 European countries urging Spain to end its opposition to improving the EU ban on finning - cutting off a shark’s fins and discarding its body at sea – and lead the EU toward a more effective finning regulation. For many years, Spain has ranked first in Europe for shark catches and has worked to obstruct the adoption of tighter rules on shark finning. The widely supported 2009 European Community Plan of Action for Sharks includes a pledge to strengthen the EU finning regulation. Holding the EU Presidency until July 2010, Spain is likely to preside over deliberations concerning these changes. The 2009 European Shark Week, held in October 2009, was sponsored by the Save Our Seas Foundation. Dive groups, aquariums and conservation organisations across Europe hosted more than 300 events to raise awareness of the sharks’ plight and collect signatures for the petition.